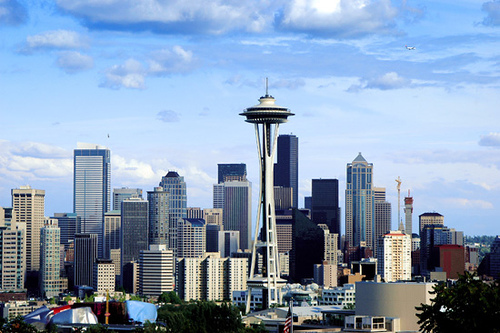 Washington State has fabulous natural beauty, lush mountain forests and a wild, rugged coastline.Beyond the cafe culture and burgeoning business opportunities, this city’s spectacular setting, perched on protected Puget Sound, is reason enough to pack up and head to Seattle. You can be driving in any of the distinct neighborhoods when suddenly your windshield is filled with a landscape of mountains, water and city skyline painted perfectly together. It could be the teeth of the Cascade Range smiling in the east over downtown Bellevue, or Mount Rainier filling a huge triangle of sky above Lake Washington, or the Olympic Mountains in the sunset across Elliott Bay. Here, more than anywhere else in the world, the forefronts of technology and urban culture stand arm in arm with dramatic coastline and high alpine terrain. 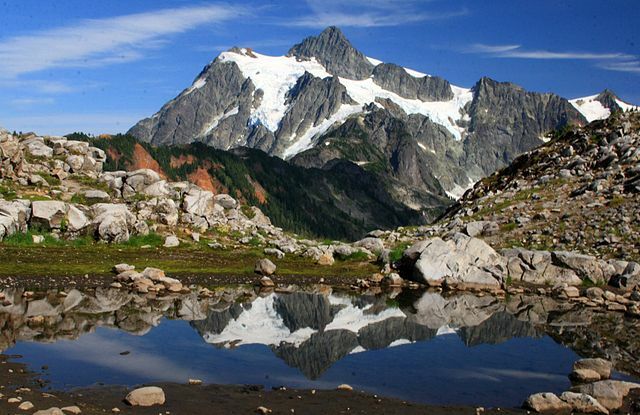 The North Cascade Range is a towering mass of granite spires and pre-historic glaciers. Amid these jagged peaks, you can walk in the quiet of ancient forests, swim in seas of wildflower and peer into the glass of alpine lakes. On the Olympic Peninsula you’re on your way to another world, barely connected by land to the major cities of Puget Sound. Peer into tidepools teeming with life or trace a river through a rain forest, to its glacial source. Ride a bike on rolling roads lined with blackberries or surf and snowboard in the same day. Explore the many worlds of the Olympic and Kitsap Peninsulas. Washington vacations, romantic Washington inns and resorts, Washington ski resorts.On a Washington vacation there are many breathtaking options awaiting you. Washington State is loaded with exciting adventures like skiing vacations, small ship adventure cruises, all Inclusive heli–skiing off an ultra luxury yacht, Whistler and Blackcomb skiing just across the Canadian boarder, faboulos fly fishing, whitewater river rafting, sea kayaking, and soft adventure float tours. In addition to offering the finest in outdoor exploration, we also propose numerous in-city activities. The climate and style are decidedly comfortable. Seattle actually gets less rain per year than New York, Chicago, Miami or Atlanta. Winters are mild and summers are perfection, with persistent blue skies and temperatures that make air conditioning unnecessary. Snow is rare downtown, but a number of impressive ski areas, some less than an hour away, receive more of the white stuff than any region on Earth. The mild climate also makes activities like golfing, fishing, whale watching and hiking possible year round. Aboard a ferry to the islands of Washington, you can look back at the white pyramid of Mount Baker standing at the edge of the continent. Eagles carve circles in the sky above. Orca whales and porpoises feed and play in the lush water below. This legendary archipelago was a gift of the glaciers that covered Washington 15 thousand years ago. It is a refuge for some of the world?s most rare and regal species, for humans who seek a respite from their life on land and for artists who find inspiration here. Galleries, vineyards and fine restaurants coexist with some of the tastiest canoeing and kayaking waters along the Pacific Coast. The Island region includes Whidbey Island, Camano Island, Fidalgo Island and the San Juan Islands. Many islands and islets make up the San Juan Islands, but it’s the four main islands, Lopez, Shaw, Orcas and San Juan, that are accessible to visitors. Highways connect Camano Island and Fidalgo Island to the mainland. The Washington State Ferry system serves the San Juans, as well as providing an alternative route to Whidbey and Fidalgo. Fidalgo itself is also a main point of departure to the San Juans and Victoria, British Columbia. Whidbey Island can be reached by driving over the majestic Deception Pass Bridge at the northern tip of the island. As you cross the bridge, look out on the incoming sea, churned and squeezed in a bottleneck of rocky, evergreen bluffs. Whidbey Island is known for its quaint inns, historic towns, white oak forests and Ebey’s Landing National Historic Reserve – 17,000 acres of protected nature and historic sites, including 19th-century military fortifications and relics of the area’s exploration and settlement. Camano Island State Park is a popular escape that encompasses 134 acres of protected forest and more than a mile of coastline. Comb the beach or ride the waves, fish the rivers or ocean depths, delve deep into the forest or bike through historic towns. Tour the ancient cranberry bogs or taste the oysters for which this region is famous. Explore the Coast of Washington. No rows of high-rise hotels or conspicuous condos here – just natural beauty, historical flavor and elegant accommodations. Washington’s coast is much more than a beach destination. Native Americans thrived here for thousands of years before Lewis and Clark first sighted the Pacific Ocean from Washington. Now families and lovers come to snuggle and watch the waves do somersaults on the sand. Adventure abounds on both land and sea, be it birding or whale watching, kite flying or winter storm watching, horseback riding or clam digging. Abundant oysters and fish are the freshest anywhere, whether you catch them yourself or just order them in a restaurant. And remember to sample recipes that include the world-famous cranberries grown in local bogs along the cranberry coast. You’re on your way to another world, barely connected by land to the major cities of Puget Sound. Whether you’re driving west, or standing at the bow of a ferry, you can’t help but stare ahead to the jagged beauty of the Olympic Mountains. You can reach the Olympic and Kitsap Peninsulas by several different routes: take a car ferry from Seattle, Edmonds, Whidbey Island, or Victoria, B.C., or drive around through Tacoma or Olympia. The scenic Olympic Loop (Highway 101) circumnavigates Olympic National Park and provides access to the entire peninsula region. 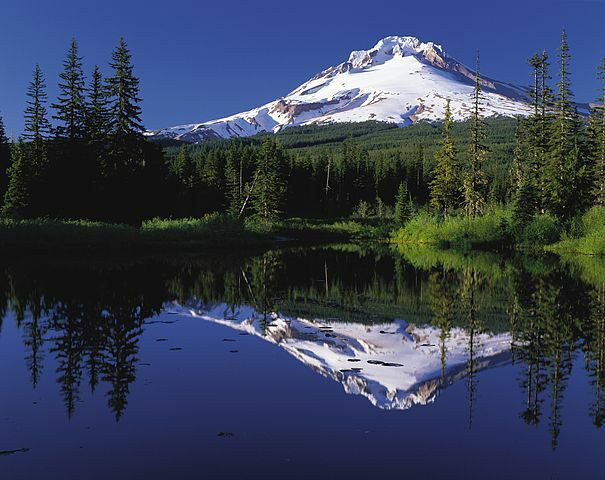 The North Cascade Range is a towering mass of granite spires and pre-historic glaciers. Amid these jagged peaks, you can walk in the quiet of ancient forests, swim in seas of wildflower and peer into the glass of alpine lakes. This is sacred country for casual hikers and extreme mountaineers alike. 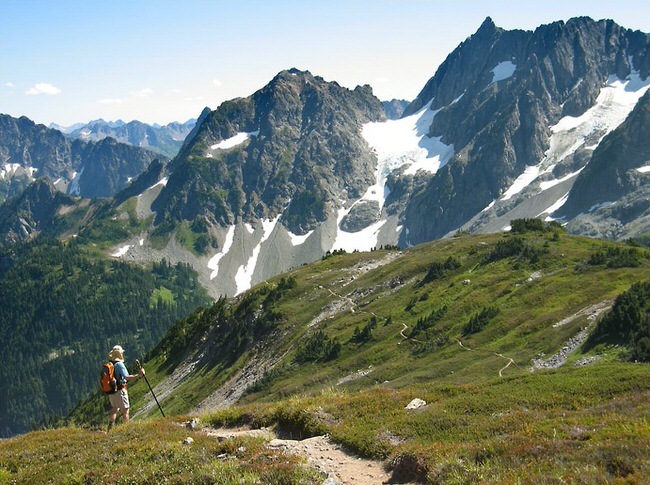 The mountains themselves, however, represent only one part of the beautiful North Cascades region. The Cascade Loop is a 400-mile self-guided driving tour from the waters of Puget Sound, across the Cascade Mountains to the vast, sun-baked orchards of the Columbia River Plateau. Take a day-trip or travel the entire Loop, from the beach to a re-created Bavarian mountain village; from tulip fields to ancient forests to the steppes of the high desert. Beside the range’s western slopes lies the lush Skagit Valley, where hundreds of bald eagles stop to rest together each winter and feed on exhausted salmon. The Skagit Valley is also home to the world?s largest tulip fields, where, in the summer, miles of color paint the earth and can be viewed from bike, car or small plane. Even the waters of Puget Sound are just an hour’s drive from the mountain shoulders of North Cascades National Park. The northeast region of Washington is still unspoiled, with vast tracts of coniferous forest and dense mountain terrain. But easy access to culture, as well as wilderness, is attracting ever-increasing numbers of visitors and transplants who discover this area?s combination of natural beauty and understated sophistication. The Columbia Plateau first formed as an immense sea of prehistoric, volcanic basalt flow. It is the second largest basalt plateau in the world, but the term plateau belies the dramatic cliffs and canyons carved by ice age floods. 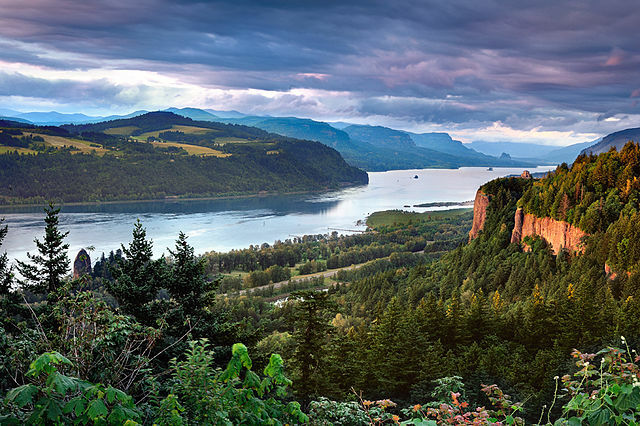 Towering rock formations and steep gorges straddle the great Columbia River and its tributaries. Orchards of apple and pear form green quilts on the wide, semi-arid terrain. If you think of Washington only in terms of the damp forests and cityscapes of Puget Sound, you will be amazed at the sculpted beauty of this high desert land. 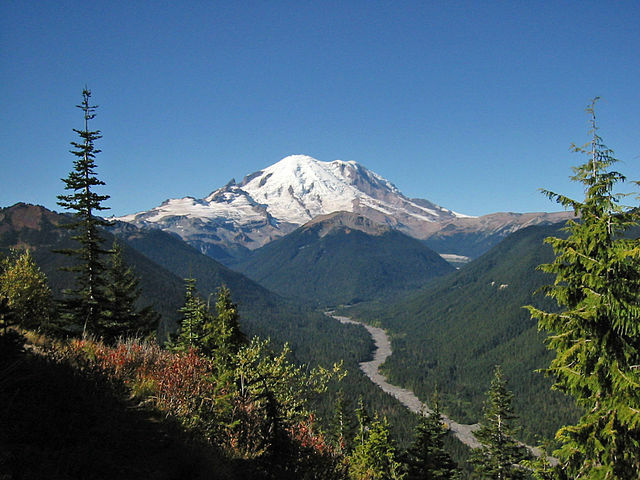 A short trip from the coffee bars of Seattle and Tacoma, three major volcanoes-Mounts Rainier, St. Helens and Adams-rise like immense pyramids from the surrounding hills. On their southern border with Oregon, the Columbia River has carved a great gorge, thousands of feet deep in spots, through the Cascade Range. These three volcanoes and a gorge are quiet but awe-inspiring neighbors to the region’s booming cities. From Vancouver, Washington in the south, to Seattle and Tacoma in the north, this is Volcano Country.